British racing driver Lewis Hamilton publicly "flirted with danger" after winning the Russian Grand Prix on Sunday (Oct 11), when he accidentally doused Russian President Vladimir Putin in champagne. The defending double world champion, known for his bubbly-spraying antics, had just received his winners' trophy from Mr Putin on the podium. And in typical exuberant fashion, Hamilton proceeded to pop a bottle to celebrate with fans, with Mr Putin - who was taking his leave after a quick wave to the crowd - inadvertently caught in the crossfire. Fans quickly reacted to photos showing the back of Mr Putin's champagne-splattered suit, as they expressed "concern" for Hamilton and posted mock eulogies on social media. One user wrote on Twitter: "Putin responds by giving his political opposition kill-squad Lewis Hamilton's home address. Nice knowing you, Lewis." Another added: "How long until Lewis Hamilton is found dead in his bath tub?" 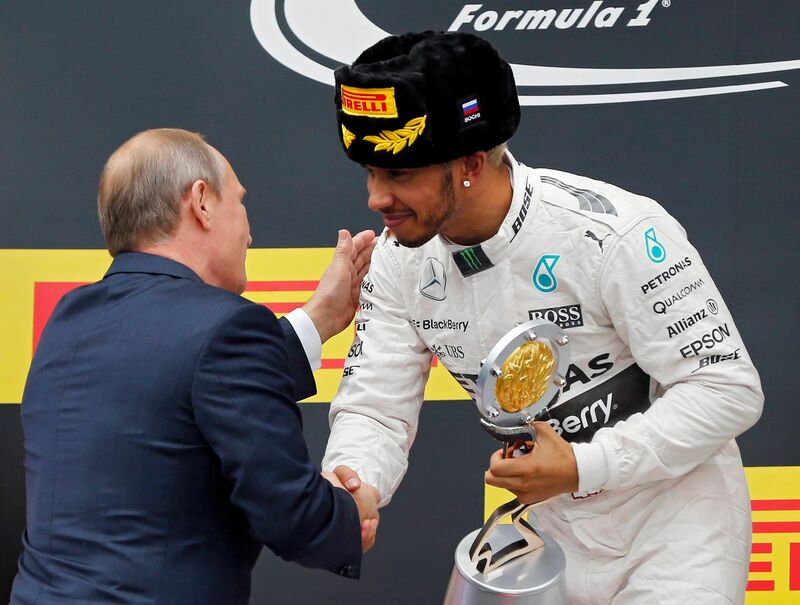 Lewis Hamilton is the only Briton to have gotten to second base with Vladimir Putin. Hamilton, 30, had come under fire earlier in April for spraying champagne at a podium girl as he celebrated his victory at the Chinese Grand Prix in Shanghai. His actions sparked a heated debate when Object, a campaign against media sexism, branded his actions "selfish" and "inconsiderate". Hamilton is on the brink of his third Formula One title and could secure it at the next race, in the United States, on Oct 25. He is currently on 302 points, 66 ahead of closest rival Sebastian Vettel.